Mary Ella Roberts was born on August 12, 1876 near Pittsburgh, Pennsylvania. Her parents, Tom and Cornelia were still living in his mother’s house with five other family members. Shortly after her sister Olive was born, they moved into a home of their own just down the street. At fifteen, her career was foreshadowed when she had three short stories published in a local magazine for a dollar each. When she was seventeen, she applied to nursing school and also met a young doctor by the name of Stanley Marshall Rinehart. They married when she was nineteen. Mary found herself in the role of homemaker and a baby boy was soon on the way. Stanley Jr. was born in 1897. Her second son, Alan, arrived in 1900 and her third son, Ted, was born in 1902. One of the side effects of her pregnancies was constant nausea and she became very weak. Dr. Rinehart’s half-brother, head of the hospital where she had been a nurse decided to try to feed her broiled lobster, bits at a time. By miracle this stayed down. This experience with lobsters served her well when she came to Bar Harbor. She had always loved to write and had many short stories published in magazines but she was too busy to do any serious writings. However, when the Rineharts suffered a $12,000.00 loss in the stock market, Mary began writing more to help out financially. Mary had also tried at writing plays. A few were Broadway hits, like Seven Days and The Bat. There were a few others that just did not make it. World War I affected Mary’s life tremendously. 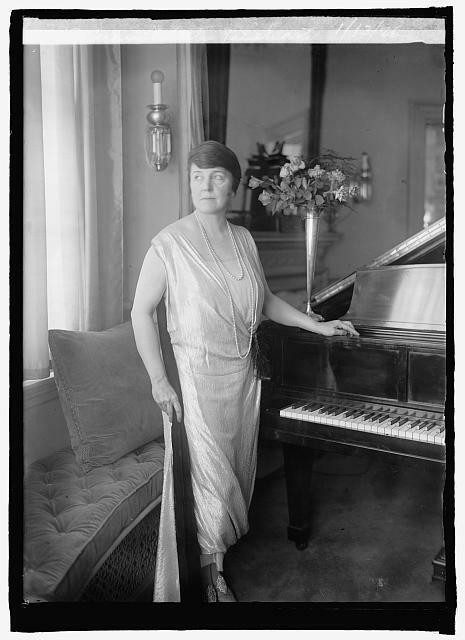 She consented to go to England as a war correspondent for the Saturday Evening Post in January of 1915. England was full of journalists and Mary wanted to get to the front but her contacts told her there was nothing they could do to help. She then convinced the Belgian Red Cross to give her the proper credentials she needed and she promised to make the American people aware of the horrible conditions at the Belgian front. In 1921, her husband, Stanley Rinehart was appointed as a medical consultant to the Veteran’s Bureau, so, they moved to Washington D.C.. They were soon caught up in the social and political scenes. Dr. Rinehart having grown frustrated with his government job and having arthritis which kept him from practicing surgery, resigned to open a private practice specializing in tuberculosis. Mary’s latest book at the time, Lost Ecstasy, a romance, was very successful. Hollywood paid her $15,000.00 for the movie rights. I Take This Woman, starring Gary Cooper and Carole Lombard was released in 1931. Stanley Jr. and Ted, along with a friend John Farrar, started their own publishing company in 1929 and Mary Roberts Rinehart was one of their first authors. Dr. Rinehart handled the finances since Mary had a tendency to spend easily. She had invested in some ventures unwisely and the Crash of 1929 had hit them hard. Stanley blamed himself and Mary thought this aided in his declining health over the next few years. Dr. Rinehart died in 1932 with his family by his side. Mary continued to live in their Washington home, alone except for a few servants. One of these was Reyes, the Filipino cook, who always considered Dr. Rinehart his boss and was somewhat uneasy about taking orders from a woman-this attitude was to have bizarre consequences later. In 1934 Mary suffered a heart attack. This left her heart weak and she was mostly unable to climb stairs and get around her big house. She also missed the rest of the family. In 1935, she moved to an apartment in New York City. The Rineharts had been spending their summers at a ranch out west or vacationing in Florida or renting beach houses on the northeast coast. She was looking for a new summer place. She first came to Bar Harbor in 1935 and rented a cottage attached to one of the hotels. In 1936, she rented a house and in 1937 decided to buy Farview. This purchase gave Mary a new interest. Bar Harbor in 1937 was changing from the carefree life of earlier days. The beautiful sea, the mountains, and big cottages were still there but a lot of the large homes were for sale. Her 1945 book, The Yellow Room was in a Bar Harbor-like setting. In the summer of 1938 Mary had a lot of construction and landscaping done. The house was built around an open courtyard with a reflecting fish pond. High on a hill, the view of the bay was breathtaking and reminded Mary of an aerie. She later renamed it Eaglesgate. She moved into the house in 1939. She furnished it in light pastel colors and colorful upholstery. She had the architect put in a low-silled picture window in her bedroom so she could lie in bed and still see the water and islands. In 1938, Mary finished her fortieth book, The Wall, set in a disguised Bar Harbor filled with intrigue, murders and a love story. She considered this one of her best novels. The Saturday Evening Post agreed and paid her $65,000.00 for the serial rights. She had just finished it when, unfortunately, she had her most severe heart attack, putting her on oxygen for a time and nitroglycerine for the rest of her life. Mary, now in her mid-sixties was slowing down. She had just four books, along with some short stories and magazine articles during the war years of 1940-46. Her summers in Bar Harbor were now filled with friends, dinner parties and social events as her health improved. Her son Alan was recovering from pneumonia one year and the two of them would go sit in the sun at the top of Cadillac Mountain. The absence of her husband’s handling of the finances were felt from time to time and at one point even put Farview up for sale. She could not let go of any of her servants. Farview was large and it was hard to find maids. She then hired a butler in the summer of 1947 and her Filipino cook, Reyes, was not happy about it. He had been with the Rineharts for 25 years and he was always highly praised for his skills. One day, Reyes, told Mary he was leaving. She was used to hearing this from him and paid it no mind. The next day, Mary found his wife, Peggy, a maid, crying. Peggy said Reyes had been drinking the night before and they had a fight when she refused to leave with him. Mary was reading in the library before lunch when Reyes came in. They spoke a few words when he pulled a gun from his pants pocket and pulled the trigger within point blank range of her face. Luckily, the gun misfired. He tried again and Mary leapt to her feet and ran. She entered the kitchen, Peggy, and Theodore Falkenstrom, her chauffeur, saw what was happening. Ted tackled the cook and grabbed the gun. Peggy ran to get the breathless Mary a nitroglycerine tablet and Ted went and threw the gun over a garden wall. The butler ran down the street to get help thinking he was the intended victim. As Mary was in the hall on her way to phone the police, she saw a young man standing outside the door. The boy said he was looking for a job as a gardener’s assistant. “Young man,” Mary said, “you’ll have to come back later. There is a man here trying to kill me.” The boy never returned. As Mary stood at the phone, again in the library, Reyes came up behind her wielding a long carving knife in each hand. Ted and the gardener came running in and again knocked him down. Peggy sat on his chest, and Ted held his arms getting cut by the flailing knives. Finally, the police arrived and took Reyes away. Mary’s son Alan flew up that night to be with his mother. The next morning he gave her the news that Reyes had hung himself in his jail cell. A Catholic priest allowed him to be buried in sacred ground since he was “Plainly of unsound mind.” Mary had no anger against the long-time cook and paid for his funeral. After all this, there was still more in store for Mary Roberts Rinehart and the town of Bar Harbor. The summer was very hot and dry, and in October a small grass fire turned into an inferno. More than 17,000 acres and almost 250 houses burnt including Mary’s Farview. She wrote several more books, including a private memoir for her children before she succumbed to a final heart attack in 1958. While she lived in Bar Harbor the latter part of her life, her presence there has never left. Farview is located on Eden Street where the Wonder View Inn is now located. Still, the view from the hilltop is breathtaking and the grounds beautiful.